It’s a challenge to provide nutritious food for a child. It’s all about the colour, texture and smell! For one child it can’t be mixed for another it has to be mixed. But the real challenge is to provide the variety needed to grow up with healthy bodies, brains, bones, muscles and nervous system. Dr Robert Verkerk and his team at the Aliance for Natural Health International have put together a guide for children’s healthy eating habits. Verkerk says that there is now irrefutable evidence that sugary and fatty foods affect regions of the brain in such a way as to trigger addiction. Colour: ensure each day that children consume ‘a rainbow’, including plant foods representing each of the six colour groups green, red, yellow, orange, blue/purple and white/tan. Flavour: Children have a natural draw to sweetness, but it’s important to develop an interest in bitter, salty, sour and umami flavours as well, whether from herbs, spices, fruits or vegetables (including fermented ones), these often being very rich sources of plant nutrients, enzymes and fibres needed to help regulate a multitude of metabolic processes within the body. “It is important that healthy eating habits are developed and instilled before the age of 5 so that they become habitual and are carried into adolescence and adulthood.” says Verkerk. Most kids eat far too much sugar. These high levels of sugars are not only rotting kids teeth at an unprecedented rate, they are also contributing to metabolic disease like obesity, at an ever-younger age. 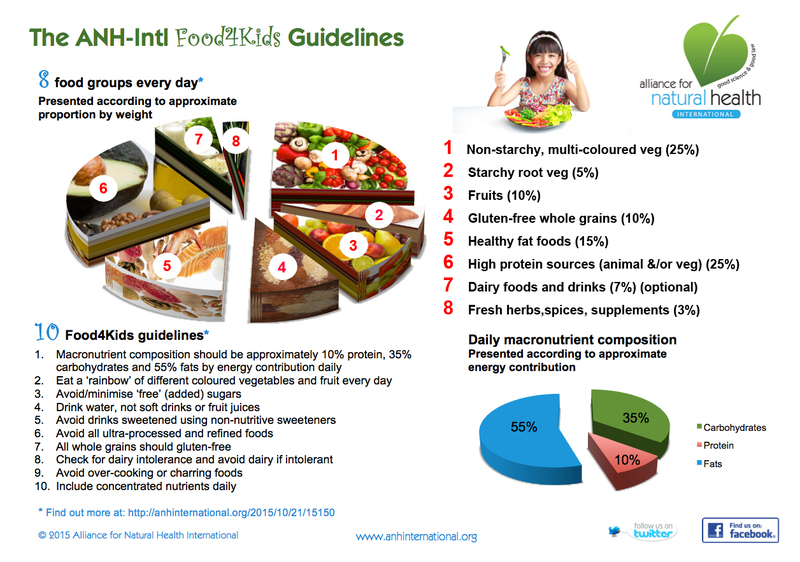 ANH-Intl’s Food4Kids guideline provides advice based both on published science, international guidance from health authorities and the benefit of experience from large numbers of nutritionists, clinicians and parents with which ANH-Intl is associated.